Lucille Reilly – …embellish a tune? Home FAQs How do I…? …embellish a tune? For several years now, I’ve heard hammered dulcimer players talk about wanting to embellish a tune. In a survey I conducted for the purpose of targeting a future book project, I asked what embellishment means. Twenty-eight dulcimer players shared their thoughts. Ornamentation: Decoration applied to single notes (trills, turns, mordents, grace notes, appoggiaturas (appoggiaturas?). Extemporization: Variations on a theme, created by adding or removing both harmonic and non-harmonic tones between the existing notes within the original tune. Embellishment can’t mean all of that, can it? When you play the tune by itself, you play the melody. 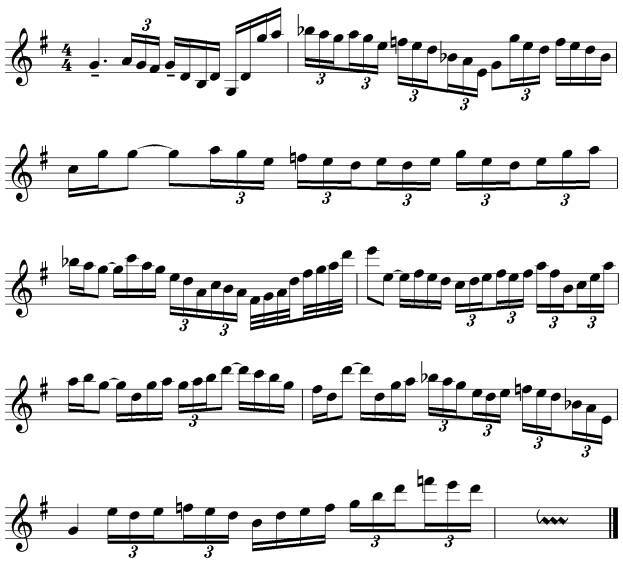 Play the tune loud, then soft (shown by and respectively below), and you play the tune with dynamics. Play the tune with harmony notes under it in the same rhythm, you: 1) harmonize the tune; 2) play double stops. Add harmony notes over the tune in the same rhythm, you: 1) harmonize the tune; 2) play a descant; 3) play double stops. Play the melody and strike the root tone only at each chord change, and you: 1) harmonize the tune; 2) play a bass line under the tune; 3) play double stops; 4) accompany the tune. Add chords to beats 1 and 3 and you: 1) chord the tune; 2) harmonize the tune; 3) accompany the tune. Play D below the starting note G on beats 1 and 3, and you: 1) accompany the tune with a drone; 2) harmonize the tune; 3) play double stops. Play the D below G after each melody note and you: 1) accompany the tune with a drone; 2) harmonize the tune; 3) play a variation on a theme. Amplify the tune with three-note arpeggios (and not quite arpeggios), and you: 1) create a variation on a theme (note the change in Twinkles rhythm, shown by up stems); 2) harmonize the tune; 3) chord the tune; 4) accompany the tune. Play mostly neighboring notes after each melody note (which means you’ll play 8th notes), and you extemporize the melody (its a little tricky to recognize, but it’s there); 2) play a variation on a theme. How about an improvisation? In this next example, the melody notes (if we could see them) would last twice as long as those in the first example (showing melody only). The melody barely appears here (only the placement of the first note on both the first and last lines match the original tune), but when played over “Twinkle’s” chord progression, the ear somehow deciphers the melody despite all the notes. Subdivide each melody note by three (notice the meter change from 4/4 to 6/8) and you: 1) create a rhythmic variation; 2: extemporize the tune; 3) play a variation on a theme. Precede most of the melody notes with grace notes, and you have ornamented, or embellished, the tune. So you see, a multitude of terms more accurately describe what has been lumped into the embellishment camp. And when it comes to conversing with musicians (it will happen some day, for those who think it won’t), this wide assortment of more specific terms will serve to avoid confusion and ambiguity. “ [Embellishment is] something to be regarded with caution: Are we adding it for beauty or to say, ‘Hey, look what I can do. Isn’t it wonderful?’ There’s a fine line between beauty and ego trip where embellishment is concerned.” While the point of improvising is to demonstrate a musician’s virtuosity rather than an ego trip, good taste (stylistically and/or according to the period of music) still prevails. And ultimately, beauty always remains in the ear of the beholder. “ Not letting the instrument just sit and ring.” What’s wrong with that? I do it all the time! To hear two good examples of ringing strings, listen to “Amazing Grace” and “Wondrous Love” on Thus Sings My Soul. Sometimes there’s no finer, more beautiful sound than hearing sustained string tones speak for themselves. Why do we have to pull so far away from what the dulcimer does naturally? It’s okay to bask in just plain long sound. See my article elsewhere in Beyond the Blog for a workshop I teach on this subject. “I dont know, either.” Nuff said! ©2004 Lucille Reilly. All rights reserved. No part of this article may be reproduced for distribution in any format without prior permission. This article was published in November 2004.